Digitization help student to explore and study their academic courses online, as this gives them flexibility and scheduling their learning at their convenience. Kidsfront has prepared unique course material of ELEMENTARY MATHEMATICS Bar Graph for CDS Exam student. This free online ELEMENTARY MATHEMATICS study material for CDS Exam will help students in learning and doing practice on Bar Graph topic of CDS Exam ELEMENTARY MATHEMATICS. The study material on Bar Graph, help CDS Exam ELEMENTARY MATHEMATICS students to learn every aspect of Bar Graph and prepare themselves for exams by doing online test exercise for Bar Graph, as their study progresses in class. Kidsfront provide unique pattern of learning ELEMENTARY MATHEMATICS with free online comprehensive study material and loads of CDS Exam ELEMENTARY MATHEMATICS Bar Graph exercise prepared by the highly professionals team. Students can understand Bar Graph concept easily and consolidate their learning by doing practice test on Bar Graph regularly till they excel in ELEMENTARY MATHEMATICS Bar Graph. 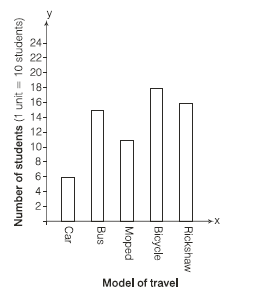 The following bar diagram represents the use of different modes of travel to school by students in a certain locality of the down. 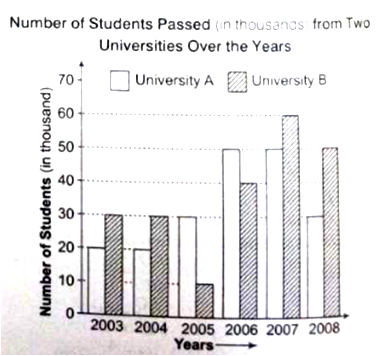 Study the graph and answer the questions. How many students are coming from that locality ? Solution Is : Number of students coming from the locality 6 + 15 + 11 + 18 + 16 =66 units 66 * 10 = 660. How many students use Bicycle and Rickshaw combined ? Solution Is : Number of students use bicycle and rickshaw = 18 * 10 + 16 * 10 180 + 160 = 340. What is the percentage of students using Bus from that locality ? 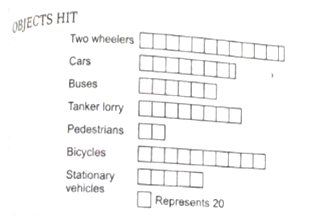 The following is a horizontal bar diagram showing the accidents in which two wheelers are involved with other objects . Study the diagram and answer the question .